The second time I met Yvonne Adhiambo Owuor she was sitting at a round wooden table in the garden of the Kwani? office in Nairobi, waiting to be interviewed on the launch of her debut novel Dust. She and I were going to spend the week together as I guided her through a programme of events for Kwani?’s 10th anniversary and the publication of her novel in Kenya. I like to think that the first time we met, or shall I say our spirits met, was when I read her Caine Prize winning short story Weight of Whispers. I was struck by the skill and grace with which she addressed the loss of ‘home’ and death, but equally new beginnings and life. I had not realized at the time that this first encounter with her writing was the beginning of a journey that would lead me to a day we finally shook hands and became ‘sisters’. Dust is a novel which speaks from hidden histories and landscapes. I was in awe of this authoress who had dared to give voice to ‘the margins’ by relocating ‘the center’ to Lake Turkana. As a region often forgotten and misunderstood, I was apprehensive yet impatient to discover how Yvonne was going to portray the place I thought of as home. In an instant, Yvonne had transported me back to that day when I arrived for the first time in Kalokol at the age of 6. The dust in every nook and cranny of my body, the searing heat, the sudden bursts of wind, the naked yet ancient and majestic landscape. She is a child of the desert who understands that the dunes, the rocks, the mountains, the wells, the cattle, the sun, the moon, the stars, the winds that carry the stories and secrets of ancestors who lived in these lands. Like the histories of Kenya, the desert of Turkana is complex and intense. A place to delve at one’s own risk and this is precisely what Yvonne does so boldly and beautifully. The story begins with the death of a son and brother who finally journeys back ‘home’ to Turkana after many years away. The loss of Odidi Oganda shatters his family as they all try to come to terms with their grief and guilt. The plot allows an exploration of the psychology of loss and is partly driven by the question: what happens to those who are left behind? The sudden and violent death of Odidi leaves his family asking “why?” As they each try to make sense of their new reality, family secrets are uncovered and old wounds are opened once more. Akai runs off into the desert unwilling to accept her son is gone, while Nyipir decides to tackle the unforgiving land by digging a cairn for his son. 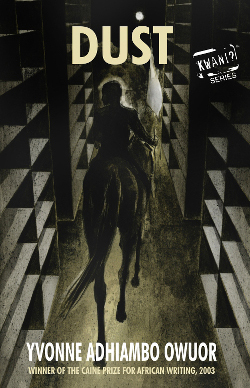 Ajany goes in pursuit of her brother, refusing to believe that he would leave her lost and alone. But the Oganda family are not the only ones who search for and mourn a loved one. Isaiah Bolton has come from England to look for the father he never knew and longs for. Once more, the paths of the Ogandas and Boltons intersect as Isaiah journeys to the house his father built in the Northern Frontier District; Wuoth Ogik is the place that both the Ogandas call home and that carries the secrets of his parents’ past. Yvonne deftly lures us in as each character’s voyage becomes our own and we are not only confronted with their individual pasts but that of a collective Kenyan past. This is a tale of death, love, despair, hope, discovery, betrayal, forgiveness, stolen lives and histories, identities, and new beginnings. For me, as a child of Kenya, Dust’s power lies in its ability to recognize and present possibilities for us to explore and understand our difficult histories from the Mau Mau rebellions to Tom Mboya’s assassination out of a love for our country. Yvonne reveals the ways these events shaped and continue to shape not only Kenya, but each one of us. She writes with elegant anger and has the rare ability to affect the human soul. Reading Dust, I felt a profound sense of belonging. jalida scheuerman-chianda was born in 1989 to a Kenyan mother and Dutch father. She grew up in Kenya where she and her younger sister spent an important part of their childhood and youth in Lake Turkana, where their parents run safaris. She recently graduated in Social Sciences from the University of Utrecht in the Netherlands. During her studies, she discovered a passion for decolonial and feminist theories, with an emphasis on silenced histories. She is currently working on short stories themed around the topic of ‘internal crisis’. 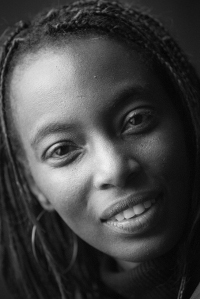 She is hoping to soon begin on a novel centered on the topic of being and growing up ‘métisse’ in Kenya. 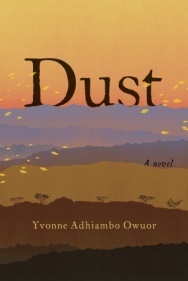 Dust was published by Kwani Trust in Kenya in November 2013 and by Knopf in the US on 28th January 2014. Book sounds fascinating Jalida, will add to the (ever-growing) to be read pile. Thank you.